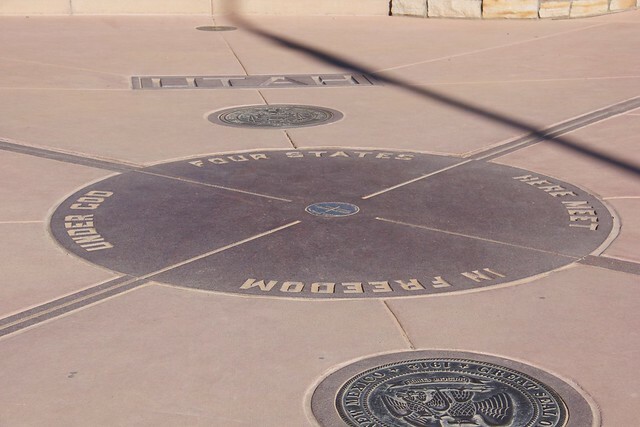 Today’s adventure took us (on this segment of the trip, I’ve been joined by Cynical Queer, but I was navel gazing when talking about the railroad, so he wasn’t introduced then) to the Four Corners Monument, which is nicely located at the corners of four states: New Mexico, Arizona, Utah, and Colorado. This was actually the second time that I’ve been to Four Corners – my initial visit was when I was a kid – I remember two things about the trip there: First, my sister, who had recently received her license, made a point of driving around the monument before parking so that she could eternally claim to have driven in Arizona before my Father. Second, the place was a bit dumpy – but parked around the point were Native Americans with the back of their pick-up trucks acting as gift shops. My mom remembers that the trucks had MasterCard and Visa signs in their back windows – this was an era, of course, before credit cards were an every day fact of life. 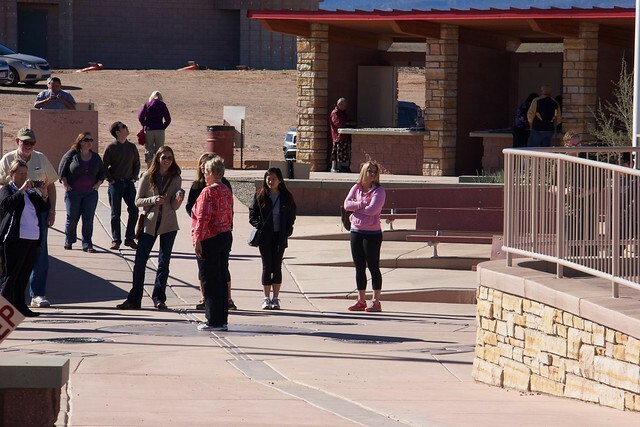 The most popular point at the Four Corners Monument. The Monument has changed a lot from what I remember – it’s now an official Navajo Nation Park, complete with a $3 per person entry fee. It’s also been modernized (save for the parking “lot”), with permanent stalls facing the center courtyard – and at the center is the point where the four states meet. At least theoretically it is where the four states meet. There’s an official marker right at the center point – but there are rumors that the actual meeting point is somewhere else. I’m balancing myself — four places at once! 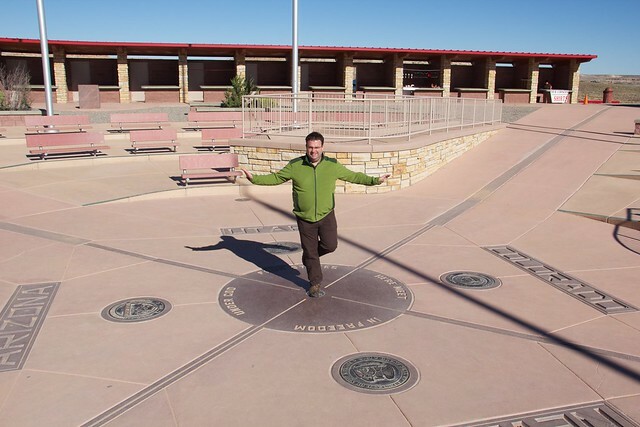 I don’t care about the rumors – I will firmly believe that the photo proves that I’m balancing on one foot in four states. So, you’re in the US right now, Senor Adamo?